Beethoven's piano trios rival his magnificent set of string quartets. His mastery of balance and sound is very evident in the Op. 70 set and the Florestan Trio are perfect in their balance and in their internal commnication - they breathe as one. Their paying in the second movement which gives the Op.70/1 its name is positively ethereal. Superbly recorded, wonderfully played, this is a great disc. This well recorded disc made in 2001 presents a most encouraging start to the projected cycle of the Beethoven trios. The Florestan Trio have established themselves firmly at the vanguard of modern performing trios and already have a string of notable recorded triumphs to their name and this shows all the signs of continuing that sequence of winners. These two trios were written during Beethoven's 'middle' period just after the Pastorale symphony (no. 6). They were written very quickly in just one month after a lapse of just over ten years since the first series of trios. In that time he had developed his thinking on the subject considerably and with these two new trios there is now a complete integration of the three instruments. The previously dominating role of the keyboard as in the Haydn and Mozart predecessors has now vanished. The apparent ease of composition, bearing in mind the speed, is reflected in the relaxed nature of the works. There are, of course, interesting facets to the compositions these works such as the three movement form of the Ghost trio, not to mention its 'ghostly' slow movement after which the trio takes its name. The following trio eschews the title of minuet in the third movement although to all intents and purposes that is what it is. Nevertheless this is a further distancing from earlier models. The Florestan's are fully aware of every detail of these works and their perfectly empathy with each other and to the music enables the performances to flow with complete ease. There is no suggestion of these being studio recordings although, of course, they are. One point worth mentioning is their suggestion that the second trio shares some constructional and key relationship features with Haydn's symphony 103, the Drumroll, and that this trio might be seen as something of a veiled tribute to Haydn, now something of an elderly statesman. This is more fully explained in the accompanying notes. Although this review has been written as if the disc has been freshly bought, readers may be interested to know that it has been a valued part of my collection for the last ten years along with every other disc this, now ceased, trio has ever made. The current reviews being written are thus a retrospective series written as CDs are being played again. I would therefore suggest that this disc, along with the others in the series, is likely to be an invaluable addition to any collection and very much worth while considering as a purchase. If you're going to own only a single disc of Beethoven trios, then you'll probably go for the famous "Archduke," and why not -- it's one of the great chamber works. But if you want to go a little further than that, you might try this recording of the two Op.70 trios. First of all, the playing is simply superb, and the recording catches and balances these three great players almost ideally. The tonal richness and tonal variety of each of them can be savored, thanks to Hyperion's engineers. Most of all, though, these are amazing works. The best known is Op.70, No. 1, the "Ghost" trio, a three movement work famous for the oddest, creepiest slow movement in Beethoven's entire oeuvre. The sliding, slithering strings, often verging on dissonance, and the wide range of the piano's interactions with them, just have to be heard to be believed, and yet the idea of the movement as expressively unified is never in doubt. The shaping of it isn't something that you can describe in terms an obvious pattern, and yet, it's clearly shaped, for all its weirdness. The outer movements, full of eruptive energy, are played with great panache and lovely tone. The Op. 70, No.2 is somewhat in the shadow of its companion, but it too is full of life and variety. The striking movement in it for me is the last -- there's nothing eerie or weird about it, but the sheer resourcefulness of Beethoven's development of the thematic material gives you the sense of always coming on something new. And again, the playing is superb. 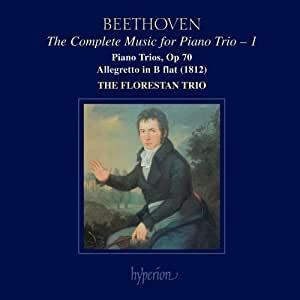 The Florestan is simply one of the great Piano trios, and they have had the good luck to have been captured in sound better than the older Beaux Arts and Stern/Rose/Istomin. The Op. 70 trios are from 1808 -- Beethoven is in full flow. These are great works by a mature artist. The Florestan Trio started out as Domus, of which I'm a big fan (highly recommend their Brahms, Dvorak and Faure recordings). I took interest in this album because of Domus' reputation, but even the brief sound samples give ample evidence that there's much more here than mere reputation. Now that I've heard the full album over a dozen times, I must say it stands out remarkably (and unexpectedly) in my collection. At present, at least, this is one of my favorite albums. My first exposure to these pieces was through the rather obscure (though solid) Trio Zingara. And while others here on Amazon have many nice things to say about the Ashkenazy/Perlman/Harrell recordings, I just don't hear anything special in them, certainly nothing that compares to these Florestan interpretations. There's an excitement and precision here in the Op. 70 trios that I just haven't found elsewhere. And while the D major 'Geister' Trio justifiably draws a lot of attention, this Florestan recording is a real revelation into just how good the E-flat Trio is too. If forced to choose, I'd actually take it over both the 'Geister' and 'Archduke' trios. This has led me to explore additional Florestan Trio recordings, and in each case I have been quite impressed. I find their Schumann and Dvorak recordings particularly convincing.